Many of my readers have posted that Cisco’s Packet Tracer does not support BGP (Border Gateway Protocol). This is not the case, in the latest version of Packet Tracer 5.3.2 there is limited support for BGP. The most limiting lack in support is Internal BGP (iBGP) and is currently not supported in the latest version of Packet Tracer. This does not allow the user to create neighbors between routers within the same autonomous systems. Although even with this limitation there is sufficient support to allow the CCNA, CCNP student to gain an understanding of this complex routing protocol and to learn how to use the following supported command within Packet tracer. BGP is the core routing protocol of the Internet. It is described as a path vector protocol and does not use traditional IGP (OSPF, EIGRP, RIP) metrics, but makes routing decisions based on path, network policies and/or rule sets. It maintains a table of IP networks or ‘prefixes’ which designate network reachability among autonomous systems (AS). 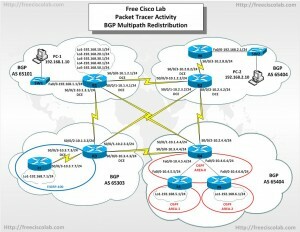 In this Free Cisco Lab Packet Tracer activity we will learn to use the limited BGP functionality of Cisco’s Packet Tracer to configure a complex BGP network. We will also refresh some of our other knowledge such as configuring EIGRP and OSPF in multiple areas. We will also learn to redistribute learned routes from the Static, EIGRP and OSPF network in to BGP. Lastly we will verify and test the connectivity of our network. Configure BGP across multiple paths. Redistribute BGP routes into EIGRP and OSPF. Use the Show and Ping commands to verify the configuration and test connectivity.